Games are serious business in China. Last year, Chinese players spent almost US$500m on online games. The government has been encouraging the growth of online gaming. It is hosting a two-day games conference in September in Beijing in the hope of attracting more foreign investment. But the phenomenal popularity of online games has fuelled concerns that some people may be losing themselves in the virtual worlds of massive multiplayer online role-playing games (MMORPG). 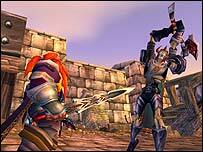 In one extreme case, a player killed a fellow player who had stolen his virtual sword. The gamer received a suspended death sentence in June. The measures announced by the Chinese authorities are due to be introduced from October. The new system will impose penalties on players who spend more than three hours playing a game by reducing the abilities of their characters. Gamers who spend more than five hours will have the abilities of their in-game character severely limited. Players will be forced to take a five-hour break before they can return to a game. "The timing mechanism can prevent young people from becoming addicted to online games," said Xiaowei Kou, of the General Administration of Press and Publication (GAPP), the body which regulates online gaming. All the biggest online game operators in China have said they will adopt the new system. According to the Interfax-China news agency, the gaming firms said they were prepared to sacrifice short-term revenues to create a healthy environment for online gamers. The operators face little choice as they need government approval to offer online gaming. 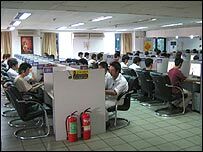 Among the games affected in initial trials of the system is the MMORPG game, World of Warcraft, which has 1.5 million players in China alone. Other games include The Legend of Mir II, The Legend of Mir 3G, Lineage II, Westward Journey Online, Fantasy Westward Journey Online, MU, JX Online, First Myth Online, The World of Legend and Blade Online. What do you think of the Chinese government's curbs on gamers? Are you a gamer and do you think that addiction is a serious risk? Are you or is anybody you know personally affected by the new rules? On both my recent visits to Western China in Chongqing I can tell you the Chinese are as serious about their video games as Las Vegas gamblers are about their slot machines. The picture they show though is hardly a true representation of the places they have. For the most part they are dimly lit, smoke filled, less than clean but crowded and dark with people waiting to use the computer. Most of the places have the windows covered so players really lose a sense of time. Also there, you will find women who work for restaurants constantly roaming around asking to bring food to players. The cost is so inexpensive that most can afford to spend all day there. They are 24/7 operations with zero controls on minimum age of players. Remember China, even though they are going through a great economic change, millions, don't have jobs or an education to work. This is a serious violation of the Chinese people's civil liberties. (whether or not the liberties are legally recognized is another story.) To have a state govern how long a person may play a game is mind boggling and a perfect example of Chinese political fascism. Why single out online games? what about console games, TV or other 'addictive' things? It's hardly fair to enforce such restrictive laws just because a tiny fraction of the users get addicted. An analogy would be proposing three hour time limits on visiting pubs because a small minority become alcoholics. Mind you, it does seem that computer games have become the world's biggest scapegoat for blaming anything on recently, so laws like this hardly seem surprising anymore. I think it's a great idea in principle. It is very easy to become lost in an MMO game as you are essentially "forced" to progress through the game content, and games tend to contain a number of "artificial timesinks" to ensure you continue playing (and therefore paying as most MMO's require monthly subscription fees). The main problem I see with this is that instead of logging off the computer and going out into the real world, people will simply use the time they are forced offline to play another game or research for hints and tips on the Internet; in essence it does not really curb their game play at all but teaches them how to play smarter and make better use of their online time. I am a gamer and I think this new time limit is a great idea. Some of the games nowadays are highly time consuming, and may cause several problems like strained social relationships or lack of sleep. It may seem as an infringement upon personal freedom, but in my opinion it would help more than harm. As always when the authorities try to control an industry, the consumers will find a way around it. For example, creating another account - this would enable 10 hours of online play a day without serious penalties (albeit forcing to use two characters and pay two subscriptions). It does seem that once again though online computer games are vilified, but what about being addicted to TV, books, offline video games, etc ? This new regulation is a very good one from my experience. I used to play online games and was part of team. The clan leader would spend his entire day playing the game and refused any advice I gave to him. Because of this, his scheduled marriage was called off and he didn't earn his degree in college for lack of study. It is a very serious issue that needs to be dealt with before there's a crash in the overall contribution to society by teens. I think game play limitation may not be favourable to the gaming population, but has become necessary. It seems like every few weeks you hear about another kid that dies or is hospitalized because they were playing a game for ridiculous periods of time with no break. Sometimes people forget there's a real world to live in, not just a virtual one. Speaking as a gamer, I can honestly say that gaming can be an addiction just like any other. However, I wholeheartedly oppose sledgehammer "solutions" like this. They only serve to punish those gamers who prefer to spend extended periods of leisure time, like weekends, gaming. Often times individuals who abandon social lives or work for gaming have other issues, just like drug and alcohol abusers who do the same. This ban will not address those issues and the sufferers will simply find another escapist outlet. As a retail manager I have experienced down turns in performance from junior male members of staff, upon investigating cause for this it became apparent several of them had been playing MMORPG games to the early hours of the morning, then attempting a complete a days work on a few hours sleep. I myself do enjoy online gaming, but feel that responsible use should be encouraged properly before forced restrictions are applied, I think these types of restrictions can infringe upon peoples rights. I am an avid gamer of mostly first person shooters. I definitely see that spending too much time in a fake world, limits what we are capable of doing in the real world. All of us are political beasts, we need social interaction that a virtual world cannot provide. Not to mention the lack of actual food and real procreation. However, three hours is not enough time to allow players to game. Prime time television lasts longer than that and then folks often watch the news. I think the government should have done this sooner. Many of my friends in China are crazy about online gaming. They can live in a internet cafe for couple days just to play the games, they can eat and sleep right there. Not mention most of them are students, they are willing to skip school to play the games which is unacceptable.